Southeast Asia's only landlocked country gets plenty of visitor traffic from its overland crossings from China, Vietnam, Cambodia, and Thailand. You can actually get a visa-on-arrival at many of these overland crossings. Only travelers with passports from Japan, Russia, Korea and Southeast Asian countries do not need a visa to enter. Everyone else needs to either have one before entering Laos, or secure one upon arrival. The visa takes up a full page on your passport and is valid for 30 days. Two passport-sized photos may be required for the application. A visa on arrival costs US $35 for US citizens; the fee varies depending on citizenship, for as little as US$30 to as high as US $42. To facilitate processing, pay the visa application fee in exact change with US dollars. Lao Kip and Thai Baht are accepted, but you may pay more for the currency exchange. The following land and air crossings provide visas on arrival to visiting foreigners. Thailand: Friendship Bridge connecting Vientiane and Savannakhet; the Nam Heuang Friendship Bridge crossing from Thailand to Sayabouly Province in Laos; and other Thai-Lao border crossings: Houayxay-Chiang Khong; Thakhek-Nakhon Phanom; and Vangtao-Chong Mek. Visas on arrival can be secured by visitors to the Tha Naleng train station in Vientiane, who come in via the rail link from Nongkhai in Thailand. Important reminder: If you are entering Laos from Thailand, decline the numerous offers by guest houses and agents to handle your visa application in Nongkhai—most of these services are scams. Vietnam: Dansavan-Lao Bao; Nong Haet-Nam Kan; and Nam Phao-Kao Treo overland crossings. Cambodia: Veun Kham-Dong Calor overland crossing. 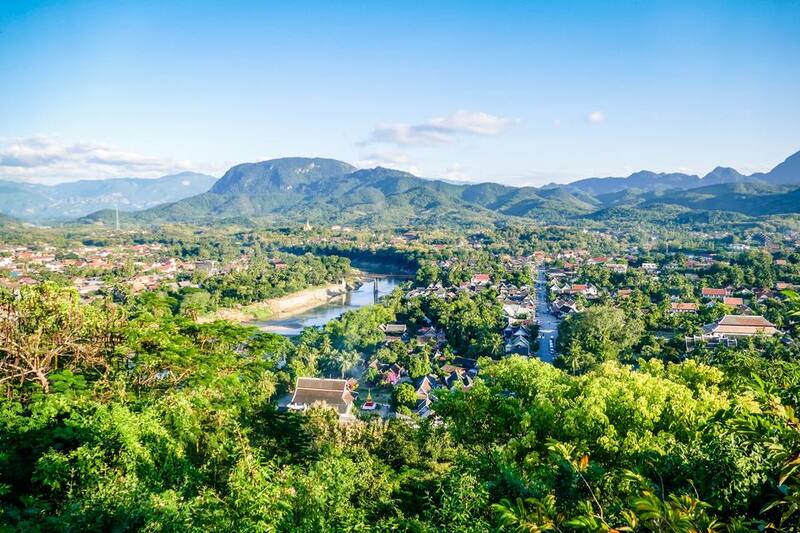 If you wish to remain within Laos for longer than 30 days, consider applying for a visitor's visa from a consulate office in Southeast Asia or at the Lao embassy in your home country. Application fees differ, but you may be granted up to a 60-day stay. Having a visa before arrival means that you may bypass some of the queues at the border, and allows access to these additional international entry points that do not furnish visa on arrivals: Napao-Chalo and Taichang-Pang Hok from Vietnam, and Pakxan-Bungkan from Thailand. Laos has consulates located all over Southeast Asia including Vietnam, Thailand, Indonesia, Philippines, Myanmar, and Cambodia. Visitors can apply for a visa extension at the Department of Immigration office in Vientiane, behind the Joint Development Bank (JDB) on Lane Xang Avenue. Location on Google Maps. The Office is open on weekdays from 8 am to 11:30 am, and 1:30 pm to 4 pm except on Fridays (closed by afternoon). Dealing with this office is not completely straightforward; travelers have been known to be turned away because of absent personnel. Factor this in when getting a visa extension, to avoid getting fined for unintended overstays due to red tape. Tourist Visas may be extended up to an additional 60 days at a cost of US $2 a day. That's far cheaper than inadvertent overstays, which might be cause for arrest and definitely will cost a fine of US$10 per day. You'll need to bring: Your passport; a passport type photo; service fee of US$3, and application fee of 3,000 kip per person. Required Vaccinations. There are no required vaccinations for Laos. However, proof of Yellow Fever immunization is required for visitors arriving from infected areas (parts of Africa and South America). Malaria is a serious risk in Laos and the usual travel immunizations for typhoid, tetanus, hepatitis A and B, polio, and tuberculosis are highly recommended. For current information about vaccinations for Laos, see the official CDC Website. Customs regulations. You must declare currency worth over US $2000 and any antiques that you may be carrying into Laos. Money in Laos. The official currency of Laos is the Kip, but you will find that US dollars in small denominations are accepted (and preferred) all over the country. Credit Cards are rarely accepted outside of tourist resorts and a commission for using them will usually be added to the bill. Traveler's Checks can be exchanged in banks in major cities for a fee. ATM machines that dispense Lao Kip can be found in tourist areas. Lao Kip is useless outside of Laos, so make sure to exchange all of your money before exiting the country. Drugs: Although drugs are widely available in Vang Vieng and other tourist areas, they are illegal and are punishable by death. Crime: Violent crime is not much of a problem in Laos, but petty theft occurs—always mind your bags while traveling. Landmines: There are still land mines in parts of Laos—always stay on marked trails and walk with a guide. Never handle a mysterious object found outdoors. Bus travel: The mountainous terrain in central Laos makes bus travel at night especially dangerous. Choose buses that take advantage of the daylight by leaving earlier in the morning. Boat Travel: The notorious "fast boat" between Laos and Thailand is a test of nerves for both driver and passengers. The lower water levels during the dry season (December to April) make speed boat travel even more hazardous.